The nexus between climate change, agriculture, and poverty has become a major topic of concern, especially for dry regions, which represent a large share of the world’s population and ecosystems vulnerable to climate change. In spite of this, to date, few studies have examined the impacts of climate change on agriculture and the adaptation strategies of vulnerable farmers from emerging semi-arid regions with dualist agriculture, in which subsistence farms coexist with commercial farms. 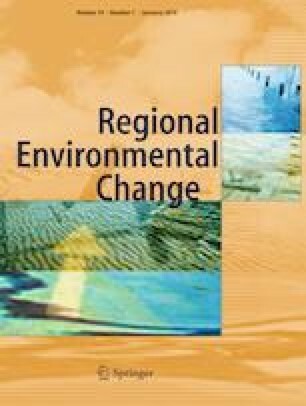 This study aims to assess the micro-level impact of climate change and the farm household adaptation strategies in a semi-arid region in Central Chile. To this end, we develop a modelling framework that allows for (1) the assessment of farm-household responses to both climate change effects and adaptation policy scenarios and (2) the identification of local capacities and adaptation strategies. Aggregated results indicate that climate change has a substantial economic impact on regional agricultural income, while the micro-level analysis shows that small-scale farm households are the most vulnerable group. We observe that household characteristics determine to a large extent the adaptation capacity, while an unexpected result indicates that off-farm labour emerges as a powerful option for adapting to climate change. As such, our approach is well suited for ex ante micro-level adaptation analysis and can thereby provide useful insights to guide smart climate policy-making. The online version of this article ( https://doi.org/10.1007/s10113-018-1380-0) contains supplementary material, which is available to authorized users. The authors would like to thank the IDRC-Canada for providing financial support for this research (no. 106924–001). We would also like to thank the Water Research Center for Agriculture and Mining (WARCAM) supported by CONICYT/Chile in the framework of FONDAP 2013—CRHIAM/CONICYT/FONDAP 15130015. Data from the field were collected under a LACEEP (Latin American and Caribbean Environmental Economics Program) research grant. This work was supported by the International Development Research Centre (IDRC-Canada) [no. 106924–001] and the Water Research Center for Agriculture and Mining (WARCAM) supported by CONICYT/Chile in the framework of FONDAP 2013 [no. 15130015].